Annie and Tyler were married on a beautiful, sunshine filled day. Their wedding was definitely one to be remembered, by all their friends and family. Elegant and romantic, clean and sophisticated, every detail was thought of and taken into account. From the ceremony to the reception venue, to an awesome live band with whom they danced the night away, their day was so grand and royal, with hundreds of crisp white flowers, bright red berries, and touches of gold. We love this photo above taken by Sky’s the Limit Photography, of the bride and groom appearing to be so carefree and fun. 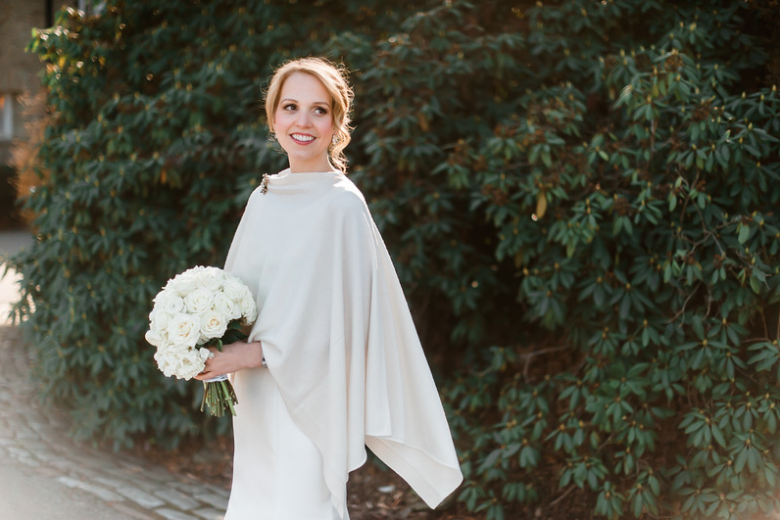 Annie wore a sleek, timeless white stain dress, with a pretty open back. 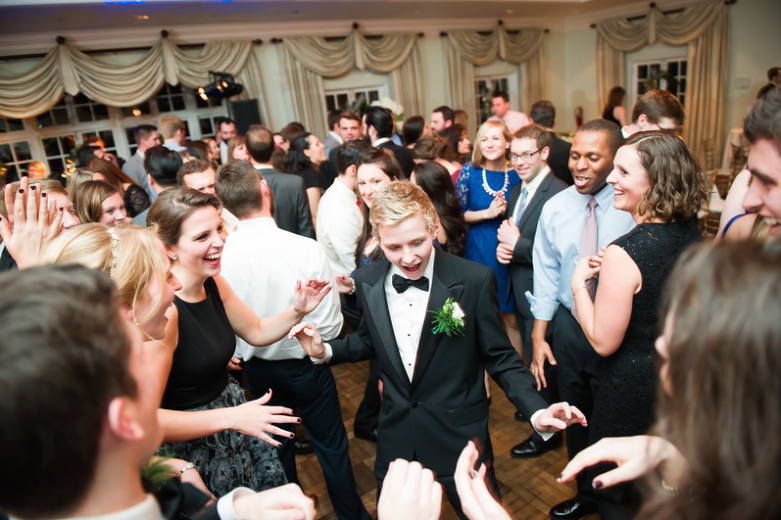 Tyler donned a black tux, white shirt, and simple black bow tie. So classy! The next series of photos capture the details of Annie and Tyler’s wedding day perfectly. 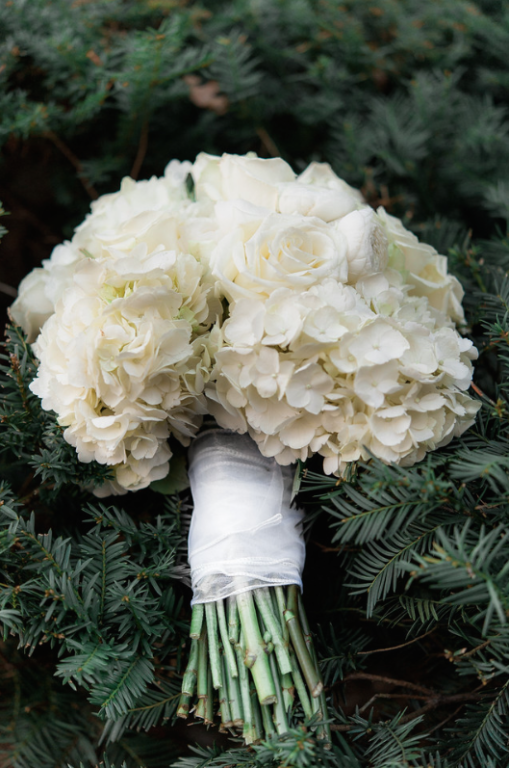 Annie’s white bouquet consisted of white roses and hydrangeas and the stems were wrapped in sheer organza. 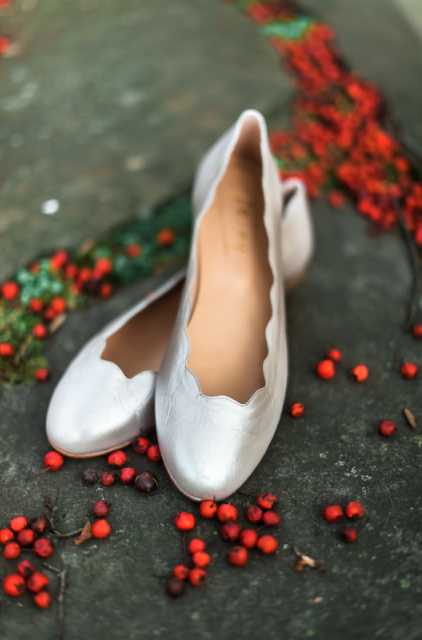 In the other photo, red holly berries were sprinkled around Annie’s white satin shoes. 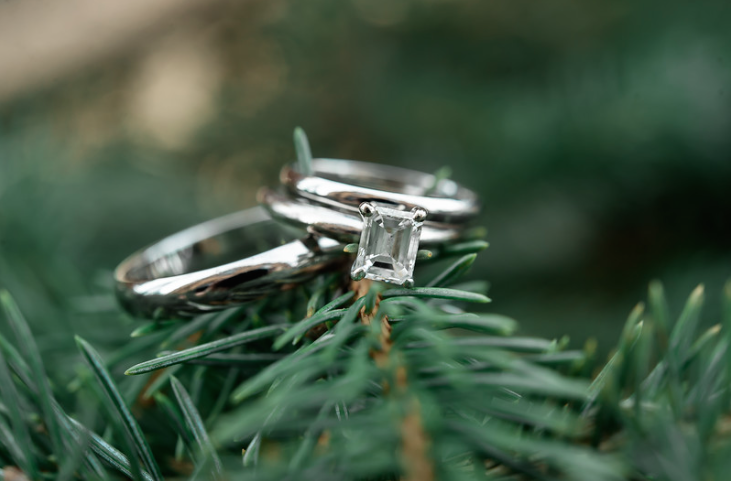 And finally, another photo shows their wedding rings resting on a evergreen branch. How stunning is Annie? She is just gorgeous. With her loose up-do, one curl tenderly caressing her face, she glows. Her diamond teardrop earrings sparkled in the sun and her beautiful shawl kept the chill away, pinned with an antique brooch. 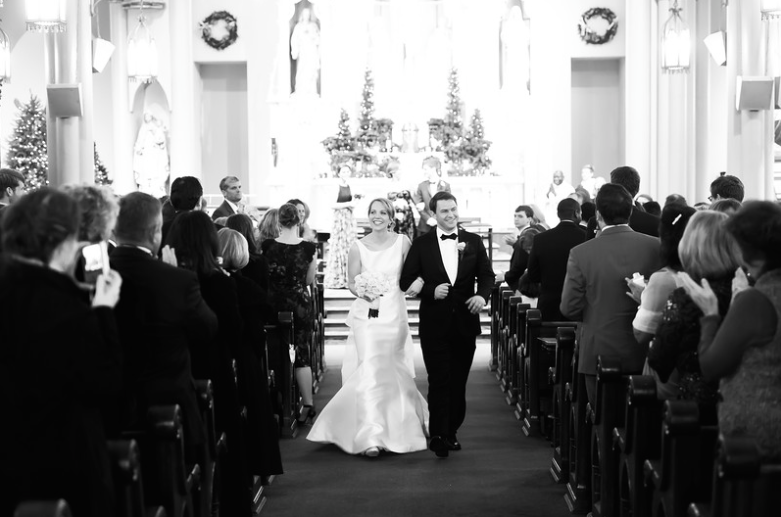 Annie and Tyler said “I do” inside a gorgeous cathedral church, St. Mary’s of the Mount. 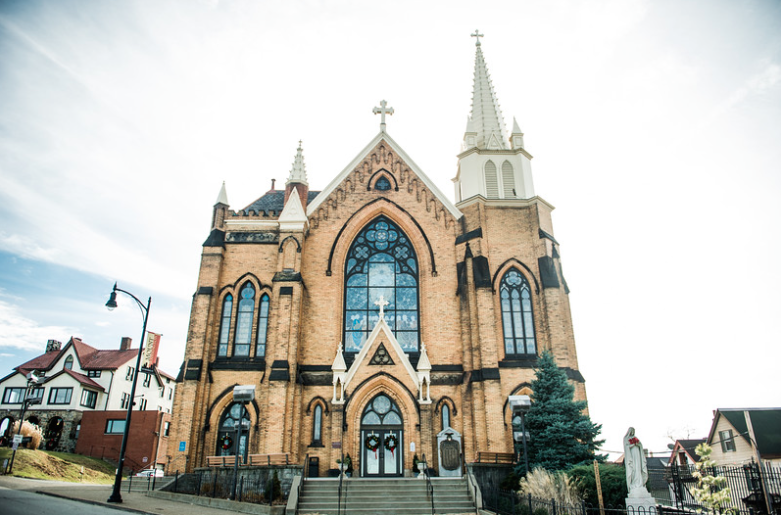 With stained glass windows, high ceilings, and twinkling pine trees, their ceremony was incredibly romantic. 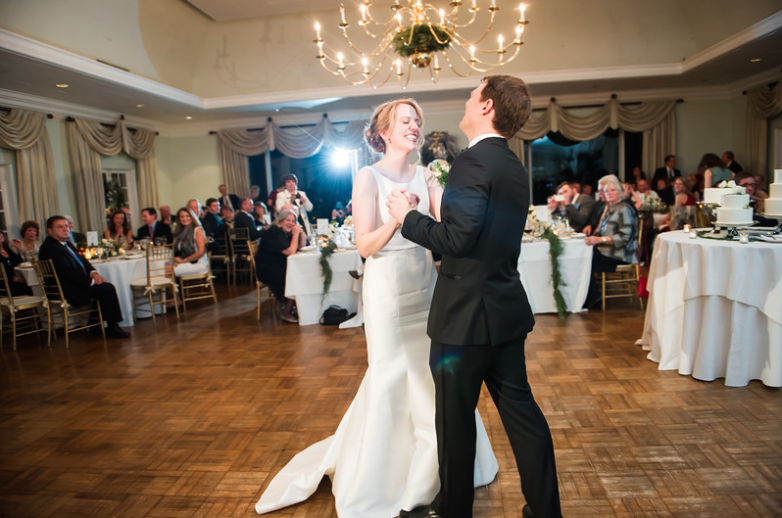 After the ceremony, friends and family made their way to the historic Longue Vue Club for the reception. Classy and chic, the reception venue boosted a mixture of tall and low centerpieces, featuring the same flowers as the bride’s bouquet- white hydrangeas and roses. 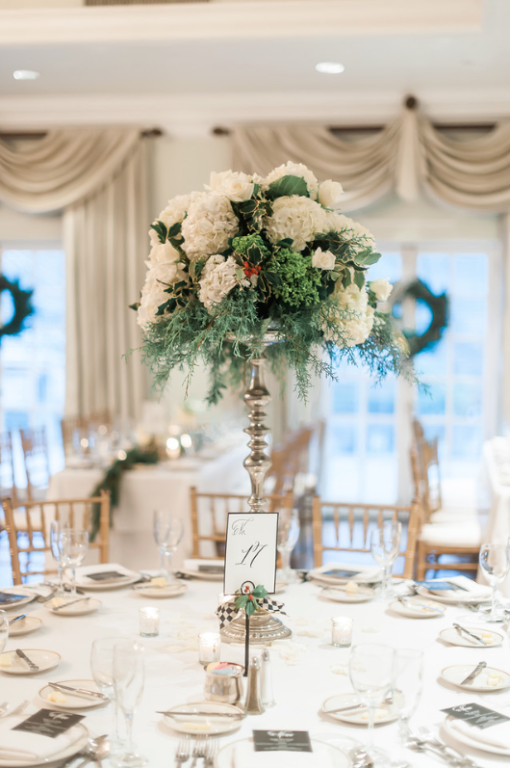 Their florist, RJ Kohler, did a beautiful job mixing in touches of evergreen and holly berries as well. Large windows and french doors gave way to tons of natural light. Wreaths hung from the windows and were accentuated by cream colored tapestries above every window. 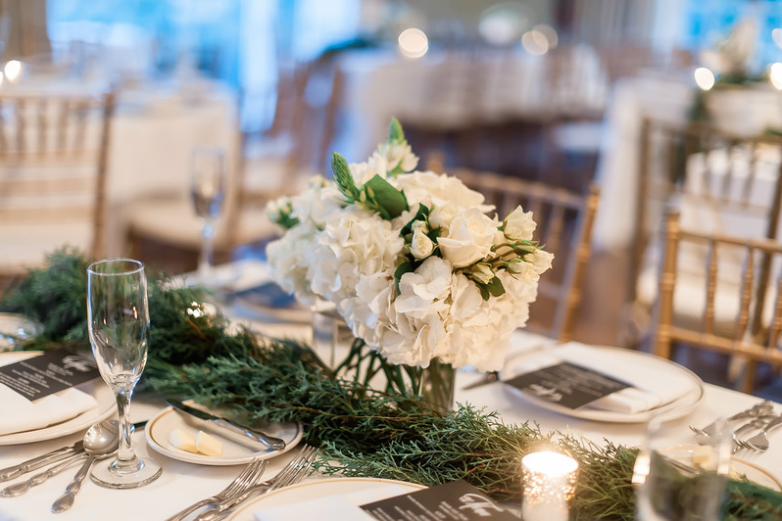 The tables were covered in crisp white linens, white china, and sparkling silverware. Silver candles gleamed, flickering softly, and menu cards were carefully placed at each and every place setting. There was not one, but three cakes at Annie and Tyler’s wedding! 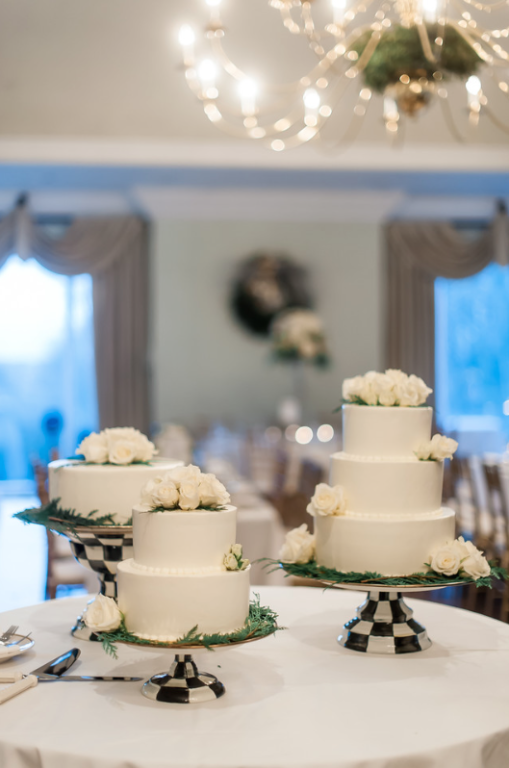 A three tier, two tier, and a groom’s cake rested on charming checkered board cake platters. The cakes were done by Jennuine Cakes and each cake was decorated with simple white roses and springs of pine. 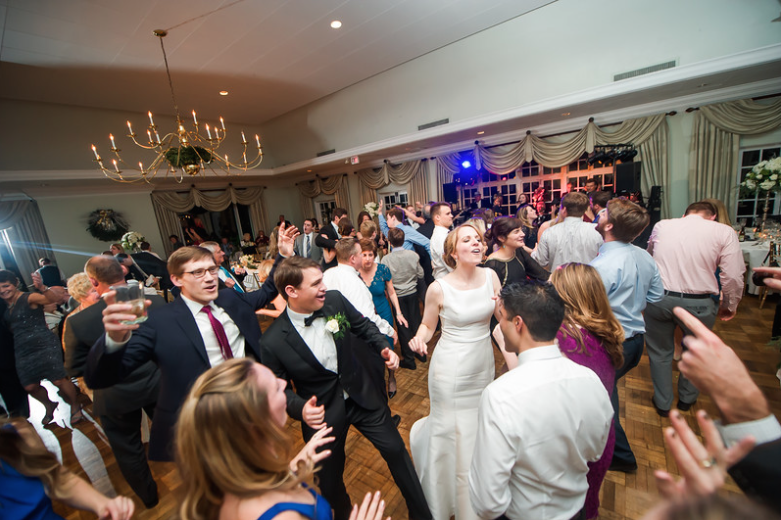 Annie and Tyler hired one of the country’s best wedding bands for the evening, the John Parker Band. The couple, who love to dance, requested the band to get the party started early in the night, with a playlist of 60’s, 70’s, and 90’s hits. We love this photo of the bride and groom clearly having a good time, Annie with a huge smile on her face and Tyler throwing his head back to laugh. 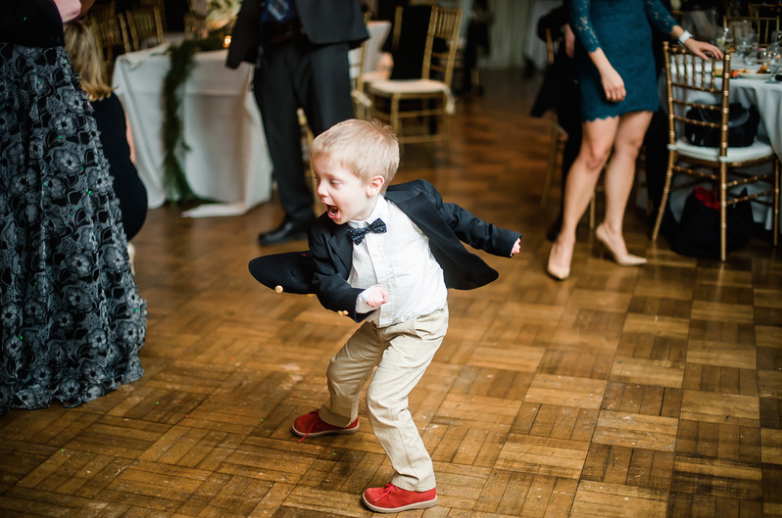 The large dance floor was in the center of the room and their photographer, Sky’s the Limit Photography, managed to capture some awesome photos of their guests of all ages enjoying themselves, as the band played on! We are thrilled to have been a part of Annie and Tyler’s wedding day. John Parker Band had a blast performing for their guests! 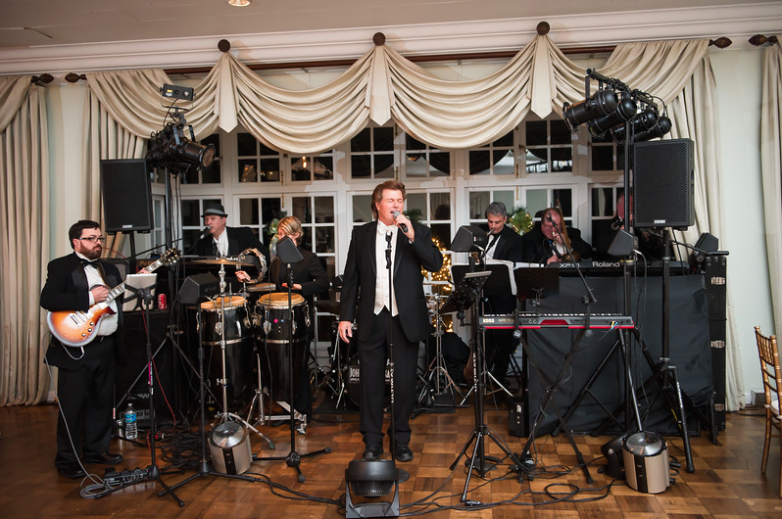 If you are looking for a awesome live wedding band for your event, please contact the John Parker Band today! If you also have a moment, take a look at their amazing wedding vendors; the florist, photographer, baker were all impeccably talented! We also must thank Sky’s the Limit Photography for giving us the opportunity to share these photos with our readers! All Contents © John Parker Band® - All Rights Reserved.